“What? You really bought only 200 grams of cookies?” our Arabic teacher Ghazwan bursts out. We had just complained that people laugh at us when we try to do that. “When I lived alone once for a month or so, I simply gave up on buying certain groceries or sweets, because nobody would sell me less than a dozen, or a kilo…” Virtually all Syrians live in large families – even young people have at least three or four children and most of them would feel lonely without their parents and siblings around them. Living alone appears outright eccentric. No wonder that the people shopping in our local market street clutch huge bags full of bread, or order 5 different sorts of pistachio pie totalling 6 kilos. The shopkeeper of the hoummous (chickpea paste) stall has consistently refused to take money when we had asked him for “just 200 grams or so in a small bag”. 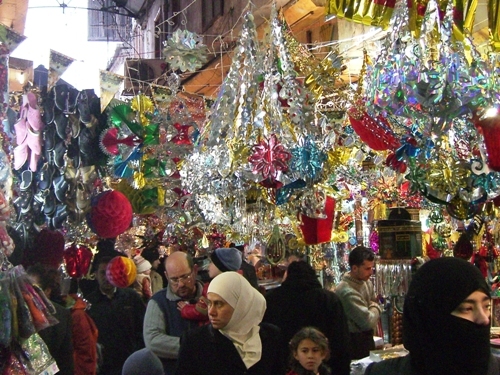 Beyond the hoummous stall, the baker, and the butchers with their display of sheep’s heads and testicles, the market street turns into an old-town souq specializing in formal men’s wear: Long brown robes with sheepskin lining, red chequered headscarves and the agal, the black ropes used to hold them on the head. A few hundred meters further on the street turns into a spice souq. Following the smell of curry, coffee and cardamom, we pass some chocolatiers and then enter a lane where every shop sells comfortable home wear for women. Our favourites are long frottage shirts in bright colours, with slogans like “Carolina” or “Let it Snow” embroidered across the chest. Finally, the passage is decked in bright garlands and blinking fairy lights. With these carnival-Christmas decorations relatives and friends welcome pilgrims who have just returned from the Hajj to Mekka. Cardboard models of the holy Qaaba are strung under the remains of a huge portico of Roman arches. The arches once belonged to the Roman temple of Jupiter. Opposite them, across a lively town square, crowds of people enter the Umayyad mosque through a huge carved wooden door. As non-Muslims we have to pay an entrance fee and to don long mud-coloured hooded frocks before we are allowed into the courtyard. When Caliph al-Walid decided to build a magnificent mosque on this spot in 705, the Roman temple had been replaced by the Byzantine John the Baptist Church for several hundred years. He persuaded the Christians who owned the plot to sell it, and proceeded to tear the church down completely. Reusing the material of the church as well as that of the Jupiter temple, he financed a vast prayer hall with an open courtyard, all covered in marble and glittering mosaics. The building’s new style inspired mosque architecture from Northern Africa to Anatolia for centuries afterwards. We sit for almost an hour at the northern side of the 315 m × 270 m courtyard, watching people. A Spanish tour group with their guide passes. In front of the imposing main entrance to the prayer hall they take a group picture of the women – in their rented outfits they look like a horde of chattering garden gnomes. As the period of the Hajj has just ended, many pilgrims have come from far away and walk around in colourful clothes. All around them, small children happily run across the huge courtyard while their parents sit in the winter sun and nibble some sandwiches. Most of the parents are rather young: At the latest when they have finished their education, people are expected to marry, but there is no legal minimum age. Marriages are not covered by the French-inspired civil law. For Muslims, the Kadi has to decide whether both partners are mature enough. “If she’s ugly, the Kadi will usually agree, at any age. It might be her only chance,” Ghazwan grinned.